Peggy Sue are a jaw-droppingly brilliant cross between Coco Rosie, Lauren Hill and Kate Nash, and their recent gig at the Windmill as part of their 4-day dash to play all the compass points of London did not disappoint. They clearly thrive on playing live, and they spiked the audience’s anticipation at every turn as they deftly dipped into a seemingly infinite battery of instruments including a melodica, a washboard, and a guitar named ‘The Stud’. 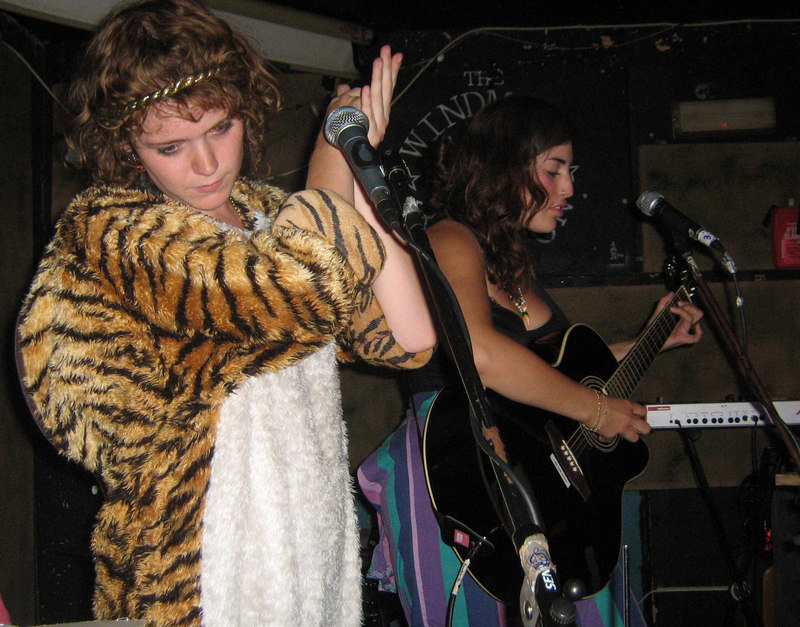 Rosa Rex and Katy Claw, who combine to become Peggy Sue, took to the stage dressed as a tiger and a clown respectively, in defiance of the tropical temperatures. Even when overheated they are utterly charming performers – just the right side of modest whilst clearly aware that what they are doing is something special. And it really is. Rosa and Katy harmonise perfectly on each of their playful narrative tracks, that is when they’re not delving into Regina Spektor-esque screeches and wails. Of particular note were ‘Escargot’, which features stunningly simplistic lyrics and beautiful contrasts between harmonica, guitar and glockenspiel, and a storming cover of Talking Heads’ ‘Psycho Killer’, for which they were joined onstage by their current backing band of choice, Left of Pictures, who also feature on the new ‘Body Parts’ EP. Peggy Sue are wry, funny and invigorating to watch. I can’t wait to see what’s coming out of the dressing-up box next.